Wooden board painted to look like a shoe. This is a great tool for assisting small children in learning to tie their laces. The wooden board has been painted bright colours and features six holes with a rope threaded through them. 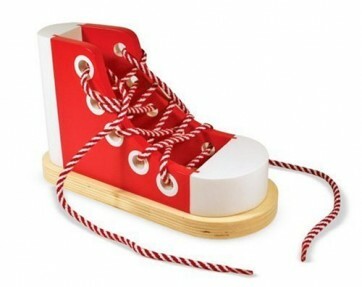 Wooden board painted to look like a shoe. This is a great tool for assisting small children in learning to tie their laces. The wooden board has been painted bright colours and features six holes with a rope threaded through them.